Hair To Be is a mobile service that comes to you on your special day. 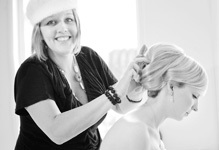 My name is Kirsty Bowler and I have been creating bridal and special occasion hair for 17 years. My passion in hairdressing is to create the beautiful style you have been searching for to compliment your total look.I specialize in bridal and formal occasion hair. Contact me on 0400214622 or kirsty@hairtobe.com.au.